I am very pleased to announce that a project we have been working on for years is one step closer to becoming a reality. The Virgin Islands Community and Heritage Tree Law is one step closer to passing and becoming part of the VI Code. Geographic Consulting was contracted in 2013 by the Virgin Islands Department of Agriculture (with funds from the US Forest Service International Institute of Tropical Forestry) to write a law for the US Virgin Islands. Brian Daley, Jennifer Valiulis, Russell Slatton, Belinda Esham and others collaborated on a project that researched tree ordinances across the country and crafted one that was appropriate for the US Virgin Islands. We solicited rounds of stakeholder input and hosted a series of public meeting in 2014. We made many rounds of changes to ensure that everyone had a voice. We made sure that standards of tree care would be high and that there would be accountability in the permitting process. t was a fun process and we were pleased with the result. 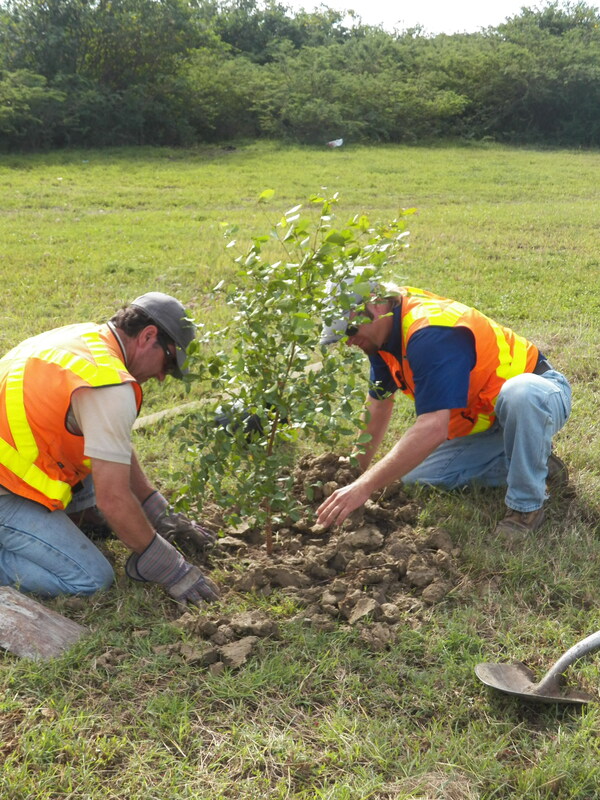 Brian Daley of Geographic Consulting leads a roadside tree planting project in Conjunction with the Virgin Island Port Authority at their airport location in the south of St. Croix. The law does a few things we are proud of. Heritage Trees, which are humans living connection to their past, are created, defined and protected in this law. Public Nuisance Trees are defined and an expedited process for their removal is created. A requirement for planting new trees on the roadside after trees are removed has been created for the first time in the Virgin Islands. This long process of urban and roadside tree loss that we have been experiencing in the Virgin Islands may soon be reversed, as a result. The press coverage, below, is a little bit confusing because it mentions protecting native trees, which the Bill does not do. The bill addresses how roadside trees are managed, pruned and removed, especially as it relates to overhead power transmission. When it passes, there will be a higher professional standard for tree care in the US Virgin Islands. There will be two supervising territorial foresters in the VI (STX and STT & STJ) that will issue permits for pruning and removal. Nationally accepted arborist standards will be required and a certified arborist will have to sign off on tree pruning work and be responsible for the quality of the work. The version that went to the senate floor has some additions I did not want and has some important wording changed. Nonetheless, I firmly believe it will have a positive impact on the management of urban forests of the VI. After the horrible tree work that followed Irma and Maria, I think most will agree that this law is appropriate, of not overdue. Please take a moment to read the law through this link. and read the coverage in the press, below. Let me know what you think!